"The Real New Order - Terror "
Poles are Incarcerated in concentration camps at Oswiecim, Oranienburg - Sachsenhausen, Mauthausen, Dachau, Ravensbrucke (for women) and in several other smaller camps. Most of the prisoners are drawn from the intellectual classes. Certificates from public departments or public utility undertakings are no security whatever against arrest. The prisoners are often taken away without coats and hats, even in the coldest of weather. They are usually transported in sealed railway trucks, seventy persons to each. Frequently the trucks, after sealing, are left standing on a siding until there are sufficient to make up a train, and cases have been known of prisoners being left thus sealed up on the siding for four or even six days, not provided With food or water or warm clothing and bedding, at a, time of deep frost. 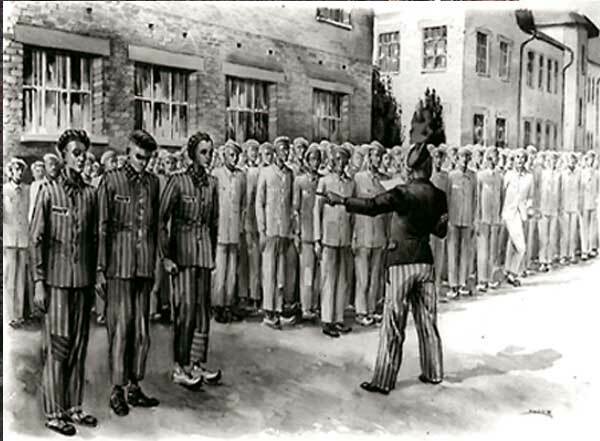 When the prisoners stamped their feet and moved about to keep warm, the guards struck their rifle butts on the sides of the trucks and ordered them to be quiet. But in any case, after a couple of days or so the prisoners did not need telling to be quiet. 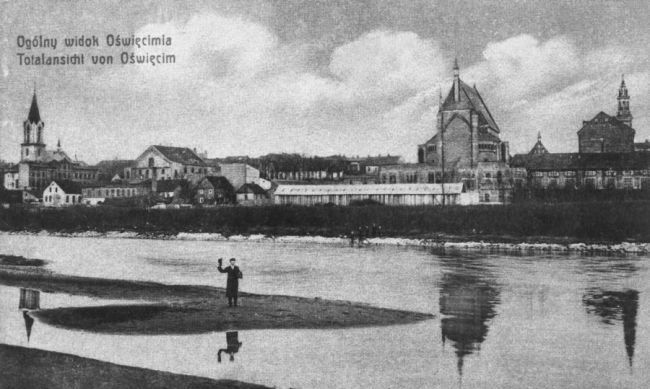 The concentration camp at Oswiecim, which is the largest in Poland, merits a detailed description. The journey to this camp may take from three to five days, according to distance and the travelling conditions. During the journey rations consisting of bread and noodles, which in wintertime were frozen together in a solid mass, were put through the ventilator window. Sometimes as many as ten bodies are removed from the. trucks which have I been held in sidings for some days, while in the winter some forty percent of the other prisoners had frostbitten hands and feet. It was common for those still alive to remove the clothes from the dead to wear for the sake of warmth. 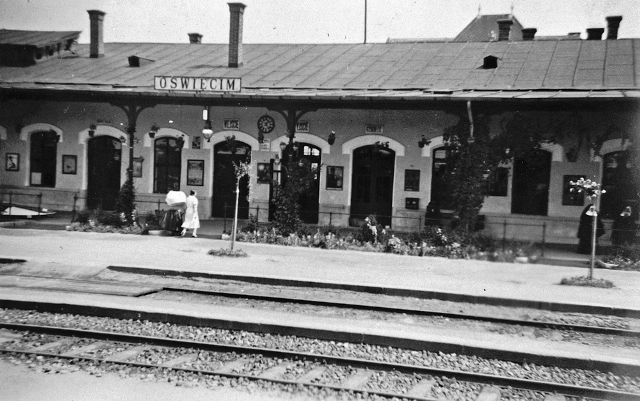 At Oswiecim railway station the trucks are shunted on to a siding with a platform specially built for the purpose. One end slopes sharply downward, and in wintertime it was very slippery, covered with ice and frozen snow. The trucks are kept sealed until nightfall, when the doors are opened and dazzling arc lamps are switched off. Blinded, numbed with cold, hungry, and dizzy with the sudden fresh air, they are unable to. step out immediately, and the police help them out with rifle butts and kicks. The older men fall and slide down the ramp. Prisoners unable to get up from. the floor of the truck are dragged out by their feet or hands and flung down the ramp. The corpses are left in the truck, and are afterwards burnt in the crematorium. The prisoners are then packed into lorries, being beaten incessantly all the while. On arrival at the camp they are ordered to fall in line in order of size. Those who cannot stand are laid out on the, ground. After the list has been checked, which usually takes a couple of hours or more they are, allotted to the various barracks. The barracks are unheated, and there are innumerable chinks in the walls. At one time a man was hanged over the door of one of the barracks, and his body was left hanging for some time. 'He was one of a group who planned to organize a hunger strike in protest against prisoners being driven out to work dressed, only in wet overalls during frosts. There is so little room for sleeping that if any prisoner turns over he disturbs his neighbors. There is only one palliasse for every three prisoners. All towels have to be kept in a single heap so that no prisoner has his own towel and the danger of infectious disease is greatly increased. Many persons suffering from venereal diseases are deliberately sent to the camp. Rising time is about 5 a.m., and three minutes are allowed for washing under a cold shower, cleaning clothes, and dressing. Sick prisoners must work as though they were quite well. No one may report sick unless he has a temperature of over 100.4 Fahrenheit. If anyone reports sick with a lower temperature he is sent to the punishment squad. The prisoners live in dread of illness, as there is no proper medical care for them. The jailers in charge of the barracks are chiefly criminals who have been given life sentences, but among them are a couple of German Communists. The jailers are degenerates, and have absolute sway over the lives of the prisoners in their charge. The prisoners are forced to do exhausting labor, frequently entirely useless. On one occasion a group of five men, including two priests, was ordered to do stone breaking. One of them tried to warm his hands by clasping them against his body, and the guard sentenced him to stand with his hands above his head for half an hour. While performing their task they were not allowed to kneel or squat down. When one of the priests, an old man; knelt down to pick up the hammer head which had come off the handle, the guard ran up and kicked the priest so hard that the blood came. One group of prisoners was given heavy blocks of wood, with which they bad to smooth the surface of stone blocks which were to be used for sculpture. A medallion with a stamp of the Blessed Virgin slipped out of the open neck of one mans shirt, and a Gestapo man at once ran up, kicked him in the face, tore the medallion away and ordered him to eat it. Another group was ordered to construct a pond. As the prisoners may not ruin their boots or socks, they were ordered to work barefoot in the snow and on the frozen mud. All the prisoners of this group were from the intellectual class. One day they were unable to stand any more, and attacked their two guards, trampling them in the. mud.